We hurt. Our hearts hurt. Our bodies hurt. We’re confused, beyond tired, and at a loss as to what our next step should be. We look diligently, even urgently, for the trust we’re supposed to have that everything is going to be okay. Reassurance would go a long way right now. 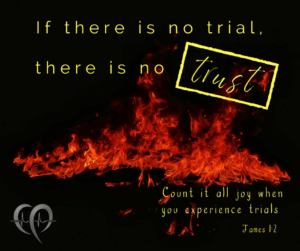 Consider this, my dear friends – if there is no trial, there is no trust. We don’t learn to trust in the easy-peasy. Those days when we can do it on our own. The victories that are win-able with little effort. There’s just no trust really required there, so no trust is really developed there. Think about it... don't we want to know God is big enough to handle our difficult times - ??? To know this, we have to be in this. Go through this. The "know" happens only on the other side of the "this." We can't develop trust where no trust is required. And so, trust is learned in the deep. In the hard. In the valleys. Or scaling life's really high mountains. That’s where trust is built because that’s where trust is necessary. The hard seasons are the ones that cause us to live close to Jesus, relying on Him for everything. Because, well - what other option do we really have? Sister, have you ever truly been in a place difficult enough that you actually had to rely on Christ for everything? Ev.er.y.thing. ??? Those are scary places. Frightening places. At least, the first time we go there, it's scary. It was for me, anyway. The day I got my pacemaker, my pulse was 19... that's a "1" and a "9"... we're weren't sure. I can't even say it - we just weren't sure. But the Lord took me to a place where my faith could develop in new ways. Ways it will not develop except in those scary, sacred places. So maybe, just maybe, we should look anew at our trials, our seasons of suffering. Yes, they're hard. Yes, we get discouraged. Lonely. Tired. Oh, so very tired.... But perhaps we can be thankful for them and see them as opportunities to experience a deeper faith, a closer walk. I’d say God is more interested in changing us than changing our circumstances. He wants us to trust Him. With everything. And we learn to do that in the hard times, because – what choice do we have ?